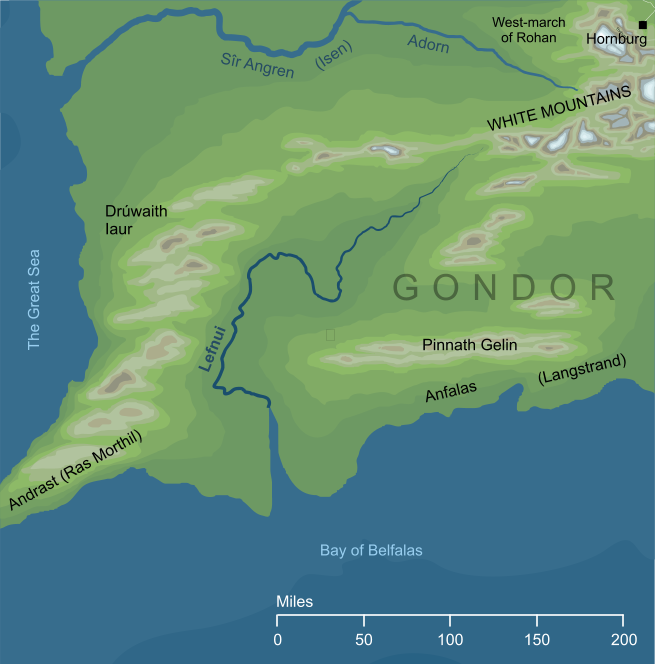 The westernmost of the many rivers of southern Gondor, the Lefnui rose in the far west of the White Mountains. It followed an erratic course through the lands west of the hills of Pinnath Gelin, until it emptied into the Bay of Belfalas through a long and narrow firth. It played little part in history, though it was remembered by the Men of Rohan. When the Dunlendings invaded Rohan in III 2758, they were aided by Gondor's enemies from the south. These sea-going marauders landed at Lefnui's mouth on their mission to overrun and destroy the Rohirrim, though they would eventually be defeated. According to the normal rules of Elvish pronunciation, 'f' is pronounced as in English, except at the end of a word, when it becomes 'v'. In Lefnui 'f' is clearly not the final sound, so we would expect the word to be pronounced simply as it is spelt. However, we do have an attested alternative spelling Levnui, which suggests that the 'f' might, contrary to the normal pronunciation rules, be intended as a 'v' sound in the middle of this particular name. That is, Lefnui was the fifth of the major rivers running through southern Gondor and into the Bay of Belfalas. Counting westward, these were Erui, Sirith, Serni, Morthond and finally Lefnui on Gondor's far western border. Lefnui is the only one of these rivers to be named numerically; the others all had individually derived names. Even the first river Erui, whose name derives from 'one, single' and can be interpreted as 'first' in principle, was actually so called because it was a single river with no tributaries. Original content © copyright Mark Fisher 2003, 2017. All rights reserved. For conditions of reuse, see the Site FAQ.